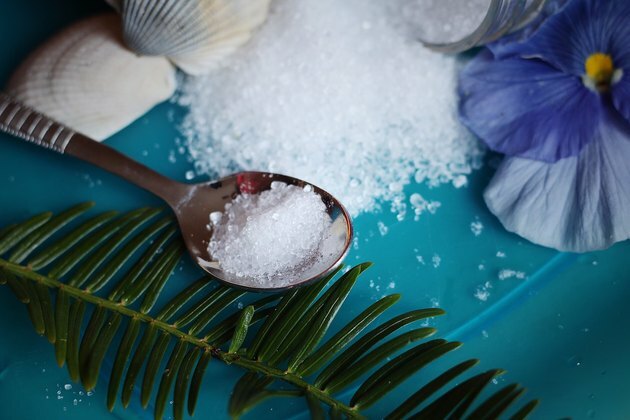 From soothing sore muscles to easing inflammation, Epsom salt has a long history of benefits for health, wellness and beauty. Despite sharing a name and similar appearance, Epsom salt is very different than traditional table salt. Instead it is a chemical compound known as magnesium sulfate heptahydrate or epsomite. Named after the English town of Epsom where it was originally found, the mineral compound was originally discovered in the 17th century by a cow herded named Henry. According to the Royal Society of Chemistry, Wicker came across a bitter pool of water that his cattle refused to drink from. While they avoided drinking it, Wicker found that the cows that waded in the pool had wounds that appeared to heal faster. Wicker also found that the crystals left over from evaporated pools of the water had a laxative effective when ingested – and so began the history of Epsom salt. Since its discovery, Epsom salt has remained an important aid for a wide variety of ailments. While Epsom salt has only been FDA-approved as a treatment for constipation, a variety of head-to-toe uses of Epsom salt are popular including reducing muscle soreness and inflammation, relieving stress and soothing skin irritation. The World Health Organization even lists Epsom salt on its Model List of Essential Medicines, a catalog of some of the most vital medications that a basic health system should possess. One of the key elements of Epsom salt is its magnesium content, an important mineral that plays a vital role in a wide variety of body processes. While magnesium can absorbed orally when obtained through diet or a magnesium supplement, there is disagreement among researchers about the ability of magnesium to be absorbed through the skin. A study published in the Public Library of Science Journal found some evidence of a magnesium cream being absorbed through the skin. However, a more recent review of the research on magnesium absorption in the journal "Nutrients" found inconclusive evidence to support the benefits of the body absorbing magnesium from either applying creams or through soaking baths. Starting with the soakers at the original Epsom spring, Epsom salt baths have long been touted for their ability to decrease stress and promote wellness. If the magnesium in Epsom salt can indeed permeate the skin, it could be good news for your bad mood. A study from the University of North Carolina found that magnesium deficiency enhanced the body’s reaction to stress. Magnesium has also been found to help raise serotonin levels, an important neurotransmitter that helps your brain regulate mood, appetite, sleep and behavior. Even if the magnesium isn’t absorbed, the warm water and rest of a bath can help reduce stress levels. You can try this at home by adding two cups of Epsom salt to a warm bath water or booking a session in a floatation tank – these rely on Epsom salt for their potential magnesium benefits and to help your body float. Regular inflammation in the body continues to become a larger and larger culprit for a wide variety of physical and mental disorders. Thanks to its magnesium content, Epsom salt has natural anti-inflammatory properties that can help ease inflammation like sore muscles, sunburns and skin wounds. The magnesium in Epsom salt can be absorbed through the skin, and it has even been found to directly reduce the body’s inflammation markers. Just like Winker found with his cattle, Epson salt has a variety of benefits for the skin from softening callouses and exfoliating dead skin, to easing sunburns and soothing irritated skin. Use Epsom salt dry or mixed with a neutral oil to create an effective body exfoliator to slough off dead skin cells. Soaking skin in mineral-rich Epsom salt water can also help to soften feet for an at-home pedicure or help remove splinters from the skin. According to the Epsom Salt Council, Epsom salt can also reduce the swelling and itch of bug bites or rashes like those from poison ivy. While there is little hard evidence on the benefits on applying Epson salt to your hair, anecdotal evidence suggests that Epsom salt can be used to help to both absorb excess oil and exfoliate your scalp. Try combing equal parts Epsom salt and hair conditioner and applying to your hair for 20 minutes which may help remove excess oil from your hair while conditioning your locks. Epsom salt can also be used as a scalp scrub to exfoliate dead skin cells. Removing dead skin cells and stimulating the scalp can help increase blood circulation in the scalp and make hair look more voluminous and healthy. While the jury is still on how much magnesium can be absorbed through the skin, one study did find that hair follicles do help magnesium permeate the skin – making the scalp an potentially more permeable platform for Epsom salt. Where Can You Buy Epsom Salt? Epsom salt is readily available at a variety of local grocery and drug stores such as Target, RiteAid or Walgreens. Be sure to look for the “USP” label which ensures the product has been manufactured, tested and certified to meet both FDA and United States Pharmacopeia standards. If you plan to take the Epsom salt internally, be sure to choose an unscented variety and follow manufacture instructions for dosage. 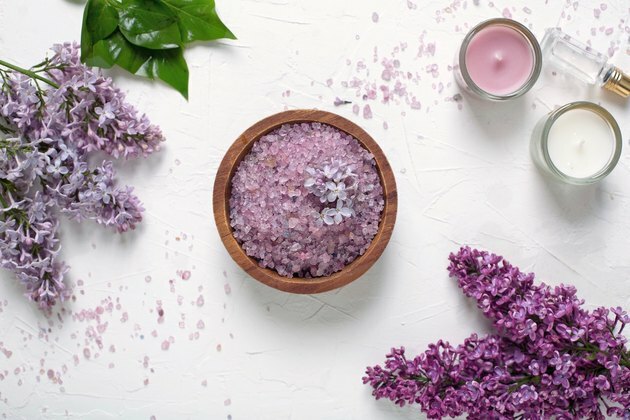 If you’ll be using the Epsom salt for a bath, you can enjoy Epsom salts that have been combined with essential oils like Dr. Teal’s Soothe & Sleep Epsom Salt scented with lavender or Dr. Teal's Relax & Relief Epsom Salt that includes eucalyptus and spearmint to further enhance your soak. According to Drugs.com, common side effects of Epsom salt include abdominal cramping, upset stomach and diarrhea. One study found liver injury in a patient who was taking Epsom salt orally. Never use a higher dose of Epsom salt than recommended on the package label, or as your doctor has directed. If you notice hives, swelling or have difficulty breathing, you may be allergic to Epsom salt and should get immediate medical help.